The reason why i started to get interested in the EMS Synthi A was because i had listened a lot to the music of Karlheinz Stockhausen. In the early 70's his musicians used the Synthi on several recordings. For example in the live electronic piece Sternklang no less than thirteen Synthis and VCS3 are used at the same time. 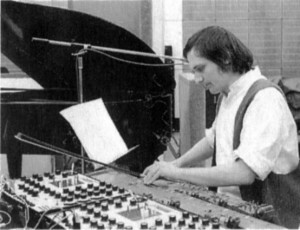 The recording of Ylem features several Synthis and in 1976 Stockhausen bought a monster Synthi 100 to use in his composition Sirius. But what caught my interest was Peter Eötvös use of his Synthi A in Stockhausens Spiral and Pole. Peter was using the Synthi A (Mk1) in combination with different stringed instruments, often a Hungarian zither. On the available recordings he uses the zither to create different kind of noises and drones - bowing, plucking and scraping the strings. The zither had contact microphones on it that was wired through the synthi. With the synthi he processed the sound of the zither using ring modulation, amplitude modulation and filters in real time. He also used the oscillators to blend in electronic sounds with the sounds from the zither. He called this setup "Electrochord". It was possibly inspired by Stockhausen veteran Harald Bojé who had used his "Electronium" with Stockhausen for some years, a circuit bent early electronic instrument by Hohner with external ringmodulators, oscillators and wah-wah filters. (I don't know much about this instrument and unfortunately Harald Bojé has passed away). 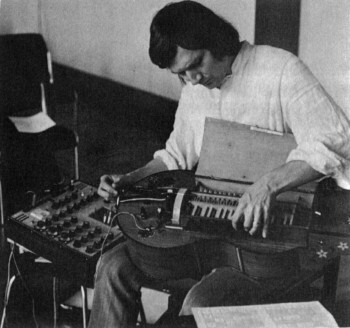 Peter Eötvös with zither, VCS3 and short wave radio. Place des Artes in Montreal, March 1971. In the background Aloys Kontarsky. Photographer Ronald Labelle. Prior to the Electrochord he was using an instrument that he called "55-Chord". It was designed for the concerts at the World Fair in Osaka 1970 where Stockhausen had his own spherical shaped audiotorium where Peter among others performed Stockhausen music for six months. Eötvös 55-Chord was a stringed instrument, elaborately tuned according to principles based on the golden ratio. There are to my knowledge no recordings of the 55-Chord, Peter describes the sound as "very exotic" but not optimal so the Electrochord was built to replace it. 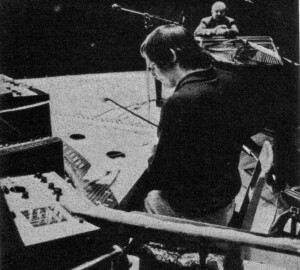 Peter Eötvös with Hurdy-Gurdy and Synthi A in Darmstadt 1972. Photographer unknown. Peter Eötvös was an early adopter of the EMS synthesizer, already in early 1971 he was using the VCS3 and the Synthi. The VCS3 was produced from 1969 and the Synthi A appeared on the market in 1971. According to Maria Eötvös, Karlheinz Stockhausen and Peter Eötvös has the two first Synthi A that was produced. Peter sometimes used two Synthis into which he had connected up to three zithers. Left: Recording at Abbey Road. From the score of "Pole" and "Expo". Photo Richard Bird. This version of the electrochord can be heard on the Stockhausen Edition CD numbers 15 Spiral/Pole (with Harald Bojé) and 11 Prozession/Ceylon and on the EMI-Electrola LP C 165-02 313/14 the latter which by the way was recorded at Abbey Road Studios by Alan Parsons who went on to produce a recording by Pink Floyd called Dark Side of the Moon two years later. During Peter Eötvös time as a performer with Karlheinz Stockhausen he also recorded his own music that was recently released on the CD Electrochronicle on BMC records. On some of the recordings on this CD he is using the same Electrochord setup as on the Stockhausen recordings. 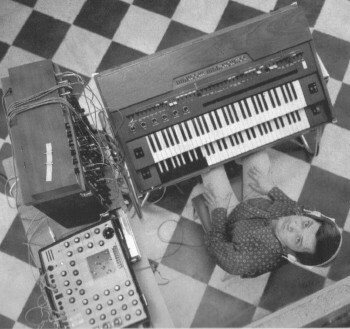 Peter Eötvös with the second generation Electrochord: Yamaha YC-45D, Synthi A, EMS Pitch to voltage generator, Short wave radio and a custom built eight channel voltage controlled filterbank at Conservatoire Darius Milhaud, Aix-en-Provence, August 3 1977. Photographer Bernard Perrine. 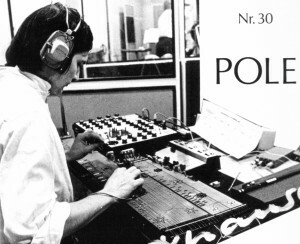 Later he re-modeled the Electrochord instrument, on a picture in the Stockhausen Edition nr 15 he is performing Pole using an Yamaha YC-45D combo-organ, Synthi A, EMS Pitch to voltage converter and an eight channel voltage controlled filterbank built by Dirk Matten. (The filterbank was also used in his chamber opera Radames). This version of the Electrochord is not featured on any Stockhausen recordings but Peter used a similar configuration for a composition of his called Intervalles-Interieurs that can be heard on a CD with the same title from BMC records. 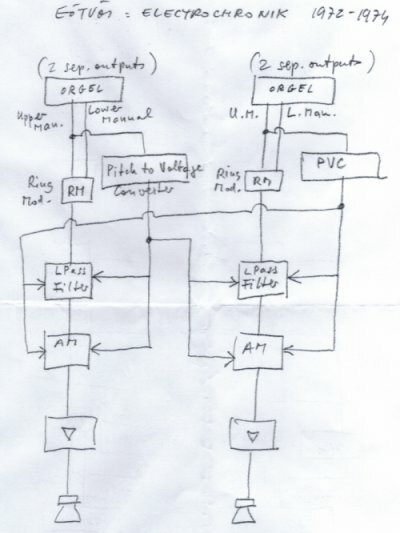 In the booklet of this CD he describes the instrument: My aim was to construct an electronic switch which, with the help of audio modulators (a voltage control filter, or VCF, an amplitude modulator, and a ring modulator), amplifies the voltage curve between the two notes (the inner movement of the complex forms arising from sinus or triangle/square waveforms familiar from the oscilloscope), and thus make it audible in the form of melody and rythm. In a figurative sense, this is an acoustic microscope: things we cannot hear with the naked ear become audible. So in this case the instrument itself, or the patch, is an integral part of the composition. I would very much recommend all the recordings mentioned in this text. Electrochronicle and Intervalles-Interieurs are two wonderful CDs. I love the Spiral/Pole CD, but it can be tough to listen to the first times so you need to give it time and listen to all the details, after that you will find it even soothing. Peter is a wonderful musician, he performs these pieces in a utterly sensitive and musical way. I think these are some of the best examples of live electronic music ever recorded. Nowdays Peter Eötvös is a very successful composer and conductor, find out more about him on his homepage.